There was a time when “the year 2000” sounded incredibly futuristic. It didn’t take long for that to become the distant past. When Crouching Tiger, Hidden Dragon became a sensation, introducing wuxia films to a wide American audience, virtually all movies of any note still premiered in theaters (where they were projected on celluloid), and it wasn’t yet mandatory to tailor absolutely everything for the global market. Who could have predicted back then that a Crouching Tiger sequel, when it finally arrived, would be available almost exclusively on a streaming site run by Netflix (“Isn’t that the company that sends you DVDs in the mail?”) and that the film’s all-Asian cast would speak their lines in English? What a difference a decade and a half makes. Some things never change, however, and one likely prediction—that any sequel would look more like an opportunistic cash grab than like a worthy successor—turns out to be right on the money. 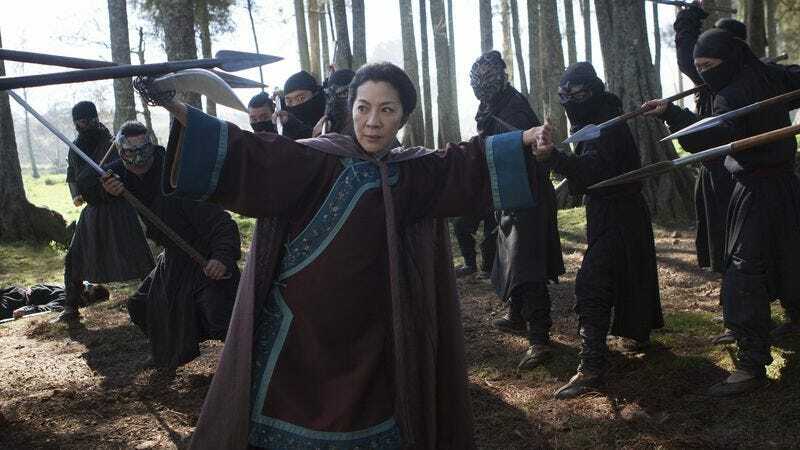 Director Ang Lee declined to return (if he was even asked), so Crouching Tiger, Hidden Dragon: Sword Of Destiny passes the reins to the original film’s famed action choreographer, Yuen Woo-Ping. The sole returning actor, meanwhile, is Michelle Yeoh, reprising the role of elegant warrior Yu Shu Lien. Ostensibly, the screenplay is adapted from the same source—Wang Dulu’s five-volume Crane-Iron novels—but more care seems to have been taken to recreate Crouching Tiger’s basic plot and character dynamics. Once again, everyone wants to steal the invincible sword known as Green Destiny. Once again, a poignant tale of thwarted love between two middle-aged adults gets juxtaposed with the love-hate relationship between a couple of kids. One could be forgiven, though, for wondering, during the film’s early scenes, whether the action has shifted from Beijing to the Shire. Partially shot in New Zealand, for some reason, Sword Of Destiny opens with Yu making her way to the home of the recently deceased Sir Te, passing through spectacular terrain that looks straight out of The Lord Of The Rings. (Subsequent shots of Beijing itself, on the other hand, are blatant digital creations—another sort of distraction, given the original film’s stunning location work.) It was Sir Te to whom Green Destiny was delivered in Crouching Tiger, and the sword was still in his possession when he died, 20 years later. Unfortunately, a blind enchantress (Eugenia Yuan) with rather vague motives has informed the evil warlord Hades Dai (Jason Scott Lee) of its whereabouts, and he sends young Wei Fang (Harry Shum Jr.) to steal it. Quickly caught, Wei spends much of the film sitting in an outdoor cage, flirting with Yu’s suspicious new pupil, Snow Vase (newcomer Natasha Liu Bordizzo), while Yu’s ex-lover, Silent Wolf (Donnie Yen), whom Yu had thought dead, suddenly reappears with a team of expert fighters he’s assembled to protect Green Destiny from Hades Dai’s inevitable follow-up attack. Anyone merely hoping for more gravity-defying fight sequences will be reasonably satisfied by Sword Of Destiny, which chugs along amiably enough and never goes very long without a skirmish of some sort. Yuen’s career as a director dates back to the late 1970s (though this is only the second feature he’s made in the past 20 years, since he switched primarily to stunts and choreography), and while nothing here is as memorable as his roof-skimming, branch-bending work in the original, he stages one particularly inventive battle that takes place on a frozen lake, with the three participants doing as much slipping and sliding as leaping and gliding. Yeoh doesn’t have remotely the chemistry with Yen that she shared with Chow Yun-Fat, but she’s very much in her element as a stern taskmaster, training Snow Vase in the martial arts even as she keeps a wary eye on the girl’s curiosity regarding the imprisoned thief across the courtyard. The fewer mental comparisons you make to Crouching Tiger, Hidden Dragon, the better time you’ll likely have. That said, what’s clearly missing from Sword Of Destiny is the singular, coherent vision that Ang Lee brought to Wang’s epic source material. Even when scenes work, they don’t always feel like they belong in this movie—the introduction of Silent Wolf and the rest of his squad plays like (very deft) action-comedy in the Jackie Chan mode (Yuen started out working with Chan, in films like Drunken Master and Snake In The Eagle’s Shadow), which bears no tonal resemblance to scenes in which Snow Vase and Wei Fang hash out their mutual tragic backstory. The melody is the same, but the rhythm is off. Plus, it’s just plain weird that everyone is speaking English. 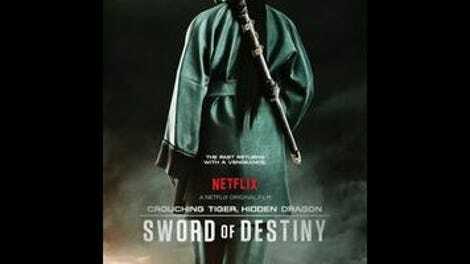 Sword Of Destiny is opening in a handful of IMAX theaters, but those watching it on Netflix might want to alter the settings, switching the audio to Chinese and turning on English subtitles. Actors’ mouths will be badly out of sync, but at least it won’t feel as if they’re talking past each other and directly to a Western audience. Feel free to party like it’s 1999.